As summer starts to dwindle down and autumn approaches, the thought of sitting under the stars next to my fire pit slowly starts to fill my mind. Sometimes there is nothing more relaxing than sitting with friends and family, shooting the breeze, and keeping warm next to a roaring fire. 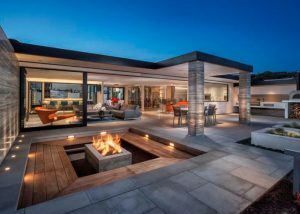 Depending on your budget, there is a fire pit for everyone. Most home and garden stores carry a standard portable pit, starting at $100. 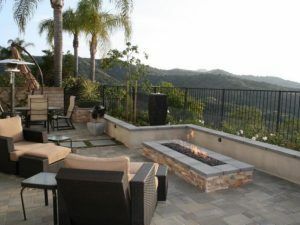 A custom fire pit designed and built by a professional contractor can have a price tag starting at $10,000. Given that these two options are at the extreme low end and high end of costs, there are countless options that are in the middle that can meet your expectations. One great example is the style below. You can easily build this yourself with a little sweat equity. Before you get out the check book and start shopping around, there are some items to consider before moving ahead. First and foremost, check with you local municipality to find what the local laws are for fire pits. 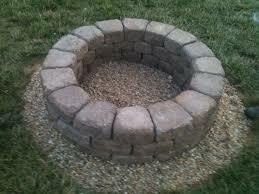 There may be restrictions or bans that will limit what type of fire pit you can have and where it can be located. 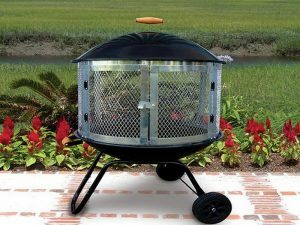 For example, some cities will only allow a portable fire pit and will have a mandatory distance that the fire pit must be from other structures. Take a look at your yard and assess several items. 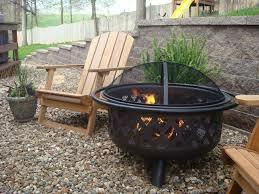 Are there any flammable objects near the area that you would like to put the fire pit? These items can be anything from a patio umbrella to yard debris and low hanging branches. It only takes one burning ember to quickly turn the situation from fun to dangerous. Be sure to have a way to put out the fire when needed, and keep it nearby. A garden hose that is connected and turned on is always a good source. Some sand and a shovel can help put the fire out when the night is over. One item every homeowner should have on hand, with or without a fire pit, is a fire extinguisher. Make sure that there is a plan to put the fire out if it either gets out of hand or if it’s time to go inside.